Roller Derby is a full contact sport, played on roller skates. Its origin in 1950’s choreographed bouts is a far cry from the sport as it is today, which pits two teams against each other in an athletic, energetic battle of strength and strategy in a spectacle that’s not to be missed. The aim of the game is for the ‘jammer’, wearing a star on their helmet, to gain points by passing the ‘blockers’ on the other team. The job of the blockers? Well, that should be obvious! Want to see it for yourself? You’re in luck! Kent Roller Girls was formed in 2010 by Demi Lition, who still skates with the team today. Kent’s first competitive Roller Derby team, they started life as a handful of skaters on the historic Herne Bay Pier. Fast forward to 2019, and Kent Roller Girls have blossomed into a strong, ever-expanding league comprising not only two competitive teams; A team, the All Stars, and B team, the Knightmares, but also a healthy Recreational League, where new skaters can come, learn how to skate and play derby in a friendly, encouraging environment before joining one of their teams. 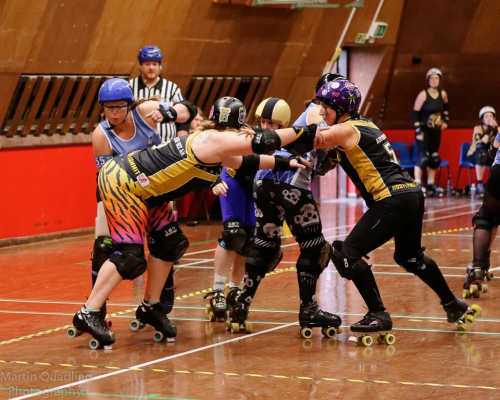 This game will be the first time Kent Roller Girls face an opponent at home since becoming an official Women’s Flat Track Derby Association (WFTDA) league. Kent won their last home game against Cambridge, with a close score of 142 : 133 and currently stand at 91st in the European rankings. London Rockin’ Rollers are 68th in Europe meaning another victory at home should result in Kent gaining on their current position. The team is very excited to welcome London Rockin’ Rollers (LRR) to their home venue. The last time these two teams met was in June 2017, which saw a hard-fought battle between KRG All Stars and LRR result in a win for London. Kent have been working hard this season, and are geared up and ready to take on LRR in what promises to be a fierce and entertaining bout. KRG Knightmares are yet to face LRR’s B team, the Badasses. B team captain, Grazed Anatomy is looking forward to the game, “I’m so proud to be captaining the Knightmares for our second home bout of the year. We’ve got some new talent, we’re working hard, and we’re a strong, cohesive unit. We’re going to go out there, play ‘our derby’, and show LRR that we’re the badasses!!”. Roller Derby wouldn’t be the same without an army of dedicated fans, so why not be a part of something amazing! Come along to support the team; make a banner, scream, shout and stamp your feet. Tickets are available online in advance or on the door. The team can’t wait to see you there! Pictures supplied by Martin Quadling Photography. 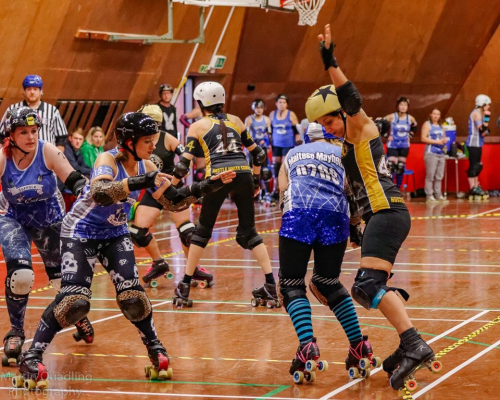 This entry was posted	on Tuesday, March 19th, 2019 at 11:30 am	and is filed under Featured, Other Sports, Roller Derby. You can follow any responses to this entry through the RSS 2.0 feed. Both comments and pings are currently closed.